The penultimate episode for Game of Thrones Season 7 did not disappoint. Game of Thrones ups the ante with a mind-blowing and ultimately shocking hour and twenty minutes of non-stop brutality. Beyond the Wall is equal parts Dungeons & Dragons meets The Walking Dead. The Night King (Vladimir Furdik) strikes a deadly blow, then gains a weapon of mass destruction in the aftermath. Arya (Maisie Williams) and Sansa (Sophie Turner) are drawn closer into conflict by the machinations of Littlefinger (Aiden Gillen). Daenerys (Emilia Clarke) suffers a great loss, but achieves clarity on several fronts. Gone are the show's labyrinthine subplots. 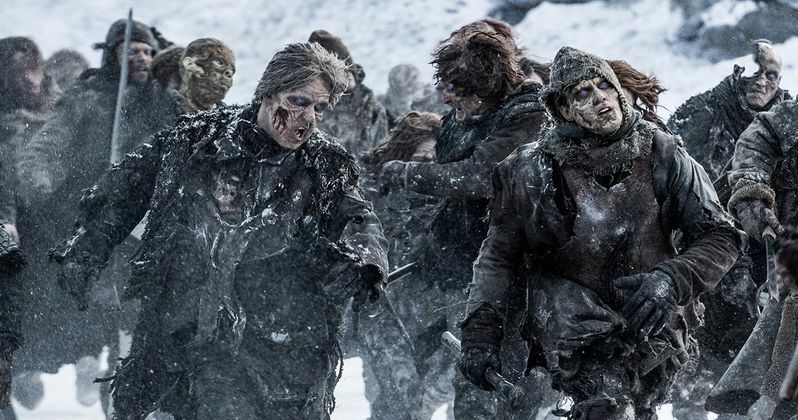 The white walkers and their army of undead wights finally take center stage. Beyond the Wall begins with a slow zoom into the fire at Dragonstone. Cut to the frozen north, the group that left Eastwatch trudges through the snow. Jon ( Kit Harington) asks Gendry (Joe Dempsie) how he's doing in the cold. Tormund (Kristofer Hivju) responds with a crass joke about keeping warm. Gendry is still upset at the Brotherhood for selling him to Melissandre. Beric (Richard Dormer) and Thoros (Paul Kaye) shrug him off, everything worked out in the end. The Hound (Rory McCann) shuts down Gendry's complaining. Jon and Ser Jorah (Ian Glen) discuss Lord Mormont's death. Jon takes off Longclaw and presents the legendary sword to Jorah. It belonged to his father. It is rightfully his. Jorah kindly refuses Longclaw. He shamed his father and his house. The sword was given to Jon. Jorah hopes the sword will remain with Jon and his children for generations to come. At Winterfell, Sansa approaches Arya above the courtyard. Arya speaks of their father, then accuses her sister of aiding the Lannisters in killing him. Sansa is stunned. Arya proceeds to read the letter that Littlefinger had planted. It was the message to Robb that Cersei forced Sansa to write. Arya tells Sansa she witnessed their father's execution, while Sansa was on stage with her pretty hair and dress. Sansa responds angrily. They are back in Winterfell because of her. Jon did not win the Battle of the Bastards. She did. The Knights of the Vale came for her. She retook their home while Arya traveled abroad. Sansa wants to know what Arya is going to do with the letter. Arya walks away in anger. North of the wall, Tormund winds up the Hound. He tells him of his lust for Brienne of Tarth. Beric comments that Jon looks nothing like Ned Stark. He must take after his mother. He continues by saying that they were resurrected to serve the Lord of Light. Jon knows nothing of the lord or why he was brought back. Beric says they are there to protect life. Death is the enemy. At Dragonstone, Tyrion (Peter Dinklage) and Daenerys talk about the future. He knows that she has feelings for Jon. She snaps back that Jon's too short for her, before realizing her mistake. Tyrion chides her for killing the Tarlys, then warns about the dangers of meeting Cersei. Daenerys has taken too many risks in battle. Their dream for a better world ends if she dies. Who is her successor? Daenerys shuts down the conversation. Any line of succession will be settled after she's won. In the north, the group is hit by a snowstorm. The scout ahead runs back towards them in terror. He's being chased by a wight polar bear. The undead beast crashes into them. Beric and Thoros light their flaming swords. The beast catches fire then lunges for the Hound. Thoros steps in front and is mauled. Tormund and Jorah kill the bear with dragonglass weapons. Thoros is still alive. He chugs alcohol as Beric cauterizes the bear wounds. At Winterfell, Sansa has Littlefinger in her chamber. She is worried what Arya will do with the letter. She hasn't heard from Jon in weeks. The north lords are fickle. They may leave with their armies if the letter becomes known. Littlefinger deviously recommends that she ask Brienne to protect her. He's already driven a wedge between the two sisters. Sowing a conflict between Brienne and Arya would leave Sansa in his vile clutches. In the north, the Hound sees the arrowhead mountain from his vision. They are close. They set a fire to attract the enemy. A white walker and his cadre of wights approach. The men ambush them. The fight ends when Jon kills the white walker with Longclaw's Valyrian steel blade. The undead wights crumble without their master's control. The group surrounds the lone surviving wight and captures it. Jon can see the army of the dead coming towards them. He orders Gentry to run back to Eastwatch. Send a raven to Daenerys for help. Gentry gives his hammer to Tormund and takes off toward the wall. Jon and the others grab the bound wight. They run to an island in a frozen lake. The army of undead wights collapse the ice with their weight. The group is marooned and surrounded. Gendry runs nonstop through the snow. He makes it to the gate before collapsing into Ser Davos (Liam Cunningham). They send a raven immediately. The day dawns with the men huddled together on the island. Thoros did not survive the night. Beric eulogizes his faithful companion as the Hound sips Thoros booze. Jon grabs the pouch and empties it over the body. They must burn him. Jorah brings up the killing of the white walker earlier. They may have a chance if they can attack the white leaders. Beric points to the Night King observing them from a nearby cliff. That is the real enemy. If they can get him, the war is won. This must be why he and Jon were resurrected. The Night King stares at them passively. At Winterfell, a raven has been received from Kings Landing. It is an invitation for Sansa to attend the meeting with Cersei. Sansa will send Brienne instead. She doesn't trust Cersei. Brienne implores her to have Podrick stay behind as a guard against Littlefinger. Brienne rebukes her. She is in her home, and in charge. Brienne is dispatched quickly. At Dragonstone, Daenerys has received the raven. Clad in a zebra-skin, white winter dress, she looks like Elsa from Frozen. She races towards her dragons. Tyrion begs her not to leave. The dream is over for everyone if she's killed. Daenerys refuses to do nothing. She climbs on Drogon's back. Soaring into the sky as her other children follow. The stalemate continues on the island. The Hound breaks the silence by throwing a rock at a wight for sport. He tosses another that bounces off the lake and skids to a stop. The water has frozen over. The wights cross the ice as the men draw their swords. They are inundated on all sides. The fight is furious and savage. The no name members of the group are quick fodder. Tormund is almost dragged underwater, but is pulled to safety by the Hound. Jon screams to "fall back". He grabs the bound walker. A screech is heard as the wights overtake them. Drogon swoops down and blasts the marauding wights to ashes. Daenerys has come to the rescue. Viserion and Rhaegal rain dragon fire from above. Drogon lands on the island. The Hound impales the captured wight on a tusk. Jon fights off attackers as the men scramble unto Drogon's back. Meanwhile on the cliff above them, a white walker hands the Night King an ice spear. He throws it like a missile towards Viserion. The spear eviscerates the dragon. Viserion crashes spectacularly into the ice, then falls dead into the water. Daenerys watches in horror. Jon and the Night King are locked in a furious gaze. Jon makes a move towards him, but then sees that a white walker has given him another ice spear. He turns around and yells for Daenerys to leave immediately. Drogon takes off with a sharp turn as the spear narrowly misses. Jorah falls off, but is grabbed by Tormund. Daenerys looks back to see Jon overrun by wights. He plunges into the lake. Jon uses Longclaw to climb out of the water. He's freezing cold and can hardly move. He raises his sword gingerly as the undead come toward him. A horse gallops through the crowd. It is Coldhands. Swinging his fire mace, Benjen Stark (Joseph Mawle) clears a path. He puts Jon on the horse, then tells him to ride for the wall. Jon escapes as his uncle fights to the end. Back at Eastwatch, the hound throws the captured wight into a boat. Beric and Tormund say goodbye to their surly companion. A heartbroken Daenerys waits atop the wall with Jorah. Just as they are about to leave, Jon's horse appears at the wood line. He is taken to her ship. Davos removes his frozen clothes and armor. Daenerys sees the stab wounds on his chest. She realizes that he did take a knife in the heart for his people. At Winterfell, Sansa has broken into Arya's room. Her search for the letter uncovers Arya's collection of faces. Arya appears silently behind her. Sansa is mortified. What are these faces? Arya tells her about Braavos and training to be a faceless man. She can become anyone, even Sansa. Arya takes the Valyrian dagger and walks ominously toward her sister. She flips the blade, then hands it to Sansa before walking away. Sansa is left with a look of terror and dread. On the ship to Dragonstone, Jon wakes up to find Daenerys by his side. He apologizes for the death of Viserion. Daenerys begins to cry for her lost dragon. She tells Jon they are the only children she will ever have. He calls her Dany, she doesn't like the name. It reminds her of her foolish brother. Jon says he shouldn't have come to Eastwatch. Daenerys disagrees. She has finally seen and understands the white walker threat. She will join him to fight the Night King. Jon takes her hand. She will be his queen. He will bend the knee. Daenerys is overcome by his pledge of fealty. These two are clearly taken with each other. She begs him to rest. Back in the north, the wight army is dragging huge chains from the water. They are bringing up the body of the dead dragon. The Night King approaches the carcass and touches its head. Beyond the Wall ends with Viserion opening a blue eye. The Night King has resurrected a wight dragon. Whew! Where to begin? Is Viserion going to breathe ice? The Night King has gained a truly formidable weapon. Arya's relationship with Sansa seems to be falling right into Littlefinger's trap. But Sansa sends Brienne away after his recommendation. I think she can tell he's up to something. I can't imagine Arya or Sansa hurting each other, but the show has no shortage of surprises. Dany didn't leap into bed with Jon, but the fire is definitely stoked. The whole timing of Gendry running back to the wall, sending the raven, and Daenerys flight to the rescue is highly improbable. Where did the wights get those chains to raise the dragon? These are slices of disbelief I am willing to suspend. Beyond the Wall doesn't hold up to logic, but is damned entertaining. This year wraps up next week on HBO with the Game of Thrones Season 7 Finale. I have a feeling the meeting with Cersei will have a few hitches.